Haiti is located in the Carribean on the island of Hispanola. 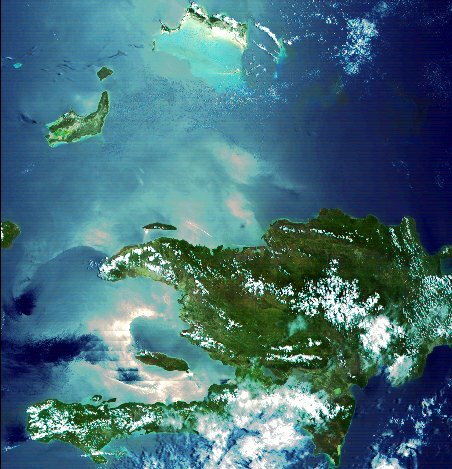 Haiti covers 1/3 of the island, it occupies the western part of Hispanola, neighboring the Dominican Republic. I collected some general information on Haiti here. For the specific place in Haiti, where our Chi Alpha groups and I do missions work, please look at the page on Fond Doux, which includes reports on our Haiti travel. Here are some outside links with facts about Haiti. More info is summarized below. The CIA factbook on Haiti. A website that collects current news about Haiti. A Haitian website with news about Haiti. There are 14 airports in Haiti (see map above), two of them are international airports (Port-au-Prince: PAP, and Cap Haitien: CAP). Several American airlines are flying to Haiti now, either from Miami (MIA), Fort Lauderdale (FLL), New York (JFK), or Atlanta (ATL): American Airlines, Delta Airlines, Jet Blue, and Spirit Airlines (restricted to 1 suitcase and 1 carry-on, requiring a fee). Other airlines provide service between the USA and Haiti: Insel airlines, Air France. Haiti is the poorest country in the western hemisphere with 80% of the people below the UN poverty line (for singles: less than $1/day income). The unemployment rate is hard to measure, but it is estimated to be 70% - 80%. The highest source sets the median income at $160/year, i.e. less than 50 cents a day. The average income is at most around $480/year. There are many sources putting these numbers at about half these values. There is a highly inadequate supply of potable water. Their language is (Haitian) Creole; more educated people know French. Haiti gained independence from France on Jan 1, 1804. The population is estimated to be close to 10 mio people. The median age is 18.5 years, that means half the people are adults and the other half are children. Life expectancy is 57.5 years. 53% of people cannot read or write. An estimated half of the population practices voodoo. 16% are Protestant Christians with 4% being Pentecostal. The AIDS rate is 5.6%, with probably a high number of people HIV infected without knowing it. The four hurricanes that hit Haiti in 2008 put the developments in Haiti back by 5 years (UN estimate). The 7.0 earthquake on Jan 12, 2010, devastated Haiti with an estimated death toll of 230,000 people and more than 1.5 mio people homeless.